I missed something here so help this old man out - what happens to the existing screen on the screen door? Kenbt - you are saying a "roll up" screen adn from rebelsbeach it looks like a "slide up" screen. Am I seeing this right? Being able to not have thescreen there is a really nice thing. I guess technically it's a slide up as there is no tension in the roller. Kind of like the old window shade arrangement,but the roll is enclosed in a box. Am I to assume the existing screen is removed completely? I believe I will be on the phone this morning when CA wakes up. Reckon this could be retro-fitted to my 2000 Horizon? Sure would love to have one and not have the navigator looking through the screen all the time. Sure would be silly to leave that screen there now wouldn't it? Here is a picture of it on my web site. Thanks John....I had forgotten you had taken the pictures of the Vectra at Lazy Days. Rebelsbeach: From your picture I assume that is your rig and have installed one also??? Where did you find it and how much..For the other interested people who want to know if it fits. 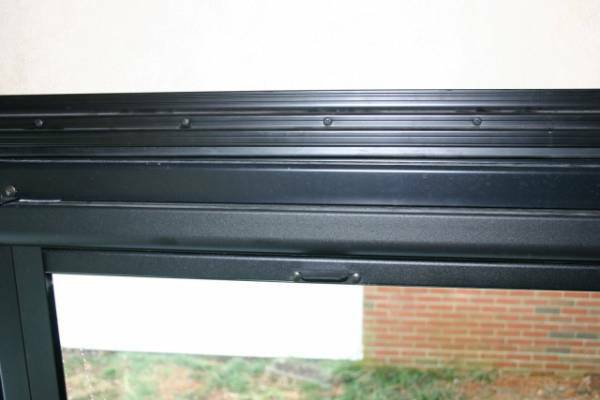 The door frame opening at the screen area for the roll up screen assembly is for a inside door width of 25 5/8 and length of 29 3/4 inches. I guess you could cut the rail lenght down if your opening is less, but the width of the screen area has to be approx 25 5/8 wide for the roll up assembly to fit. Ken,sorry to mislead you but mine came from Forest City with the new coach.